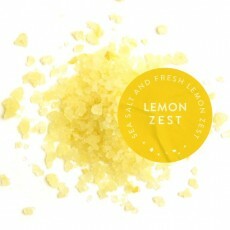 Our 100% Pure Amagansett Sea Salt blended with fresh lemon zest. We like it best on seafood and vegetables, but the heady citrus notes add a wonderful flavor to fruit and salads as well. Actually, we haven't found anything that doesn't go well with this blend. This salt tends to "brighten" foods it is used with. Our lemon finishing salt is the favorite of customers at the farmers' markets we attend. One not-to-be-mentioned trendy restaurant (we don't encourage name dropping!) sprinkles a few crystals over a crudo for a fantastic appetizer. Try barely cooking some fresh scallops, plating them on warmed greens and then sprinkling a half-dozen or so crystals on top of each scallop for a quick, easy and positively fantastic dish. Available in 1-ounce net weight and 2½-ounce net weight sizes, each in an attractive glass jar that looks great on a countertop.